I am thinking of getting pregnant soon. What should I do now? We all know that healthy women have a better chance to have a healthy baby and uncomplicated birth. Since only healthy women with healthy pregnancies can be clients at House of Birth, you should become as healthy as possible – both mentally and physically – before you become pregnant. Do it now! Eliminate unhealthy things in your life, such as alcohol intake or smoking. Ask your doctor to switch your medications to those safe for use during pregnancy. Stay away from toxic chemicals. Improve your diet with plenty of natural, high quality proteins, fruits, vegetables, and whole grains. At the grocery store, shop along the “outside edges” of the grocery area to find the freshest foods in their most natural state. Start a good, food-based multivitamin with 800 mcg of folic acid. Start a gentle exercise program like yoga, walking, or swimming. See your health care provider for a “preconception visit” to discuss any concerns. Remember that the most important prenatal care is the way you care for yourself and your unborn child. Continue the good health habits you began before becoming pregnant. Don’t get tired of working hard to do the best for you and your unborn child! You can schedule your first prenatal visit as soon as you want: we usually see women for the first time at about 10-12 weeks pregnant (about 6-8 weeks after your first missed period). If you come before the 12th week we may not be able to hear the baby’s heartbeat yet, but we can begin care and discuss diet and your health during early pregnancy. Why should I go to a midwife? Midwives view pregnant women as clients, not patients. Midwives provide specialized, personalized care which focuses on the entire family. 30-60 minute-long visits give us time to get to know you and educate you about your body and pregnancy. We treat you as an equal partner in you care. We expect and require that you make good life choices while in our care. Our focus is on helping pregnant women be healthy and produce healthy babies. We are trained to handle complications and emergencies, should they arise. For more information, see the American College of Nurse Midwifery website. Describe prenatal care with a midwife. Each visit lasts about 30-60 minutes. We listen to your wishes, needs, joys, and concerns to help you plan for your birth. We perform or order routine lab work. We check your vital signs. We check the fetal growth, position, and heart rate. In other words, we work to verify that pregnancy is proceeding normally, and establish a relationship of trust that will carry us through pregnancy, birth, and beyond. How is a birth center different from a hospital? A licensed, homelike facility where women may give birth. A place that provides family-centered care for healthy women before, during and after normal pregnancy, labor and birth. Our c-section rate is very low, about 10%. The national average is over 28%. Some hospitals in north Texas have c-section rates as high as 45-75% or more. I heard that birth centers only care for “low risk” pregnancies. What does that mean? Healthy women without health problems. Pregnancies progressing uneventfully for 37 – 42 weeks gestation (up to two weeks past your due date). or a medical problem with the baby (heart defect, etc) that will require special care. If you’re not sure about your situation, arrange for a consultation with me. Yes, I can help you obtain a sonogram from a skilled sonographer onsite on Friday’s or offsite as needed. Do you offer regular testing during pregnancy? Yes. I believe in the appropriate use of technology and informed choice/consent. Your pregnancy and birth are yours—I am here to educate you and make it as positive an experience as possible. You can opt for as many or few interventions (ultrasounds, labs, etc.) as you like, as long as you understand the risks and benefits of accepting or declining. How much does care at House of Birth cost? I have a global fee that covers all midwifery care that I provide for you and your baby from pregnancy through the postpartum period. Birth center costs are typically 1/3 to 1/2 the cost of a birth in a hospital. I offer discounts for early- and pre-payment. I do not take insurance in lieu of payment for the Midwifery services. I will give you a bill that you can submit to your insurance company. The facility is in-network with Cigna. I am working to get in-network with more companies. What kinds of childbirth education are available? Bradley, Lamaze, Hypno-birthing, and other styles are available to you. You can research them all. We can help you find a teacher, but ultimately the responsibility is yours. Although there are no restrictions on how many people you can have at the Birth Center, I discourage huge “birth parties” that can make you feel pressured to perform or show how great birth can be. Bring only the support YOU need. You may bring supportive friends and family members, or you can come alone with your partner/ labor support. You may choose to have the assistance of a doula at your birth. In general, at the least, a midwife and birth assistant are present for deliveries. The midwife is with you for your entire labor and birth; the assistant comes for the birth and stays for your postpartum care. Yes. Labor is hard work, and I encourage you to eat, drink, and rest to support your body. You need to stay hydrated by drinking plenty of fluids, especially those with nutrients and calories (like juice, sports drinks, and sweetened herbal teas) to keep your muscles working as effectively as possible. Although some women lose their appetite during labor, you are encouraged to eat light foods if you feel like it. Listen to your body’s needs. Some women will tell you that they “couldn’t have done it without an epidural”. Strapped to a bed (usually on her back) with electronic monitors and IVs, alone in a sterile hospital room, clothed only in a hospital gown, forbiden to eat or drink, powerless, out of control, and faced with a constant stream of strangers (many performing exams and “managing” labor), what other coping mechanisms does she have? 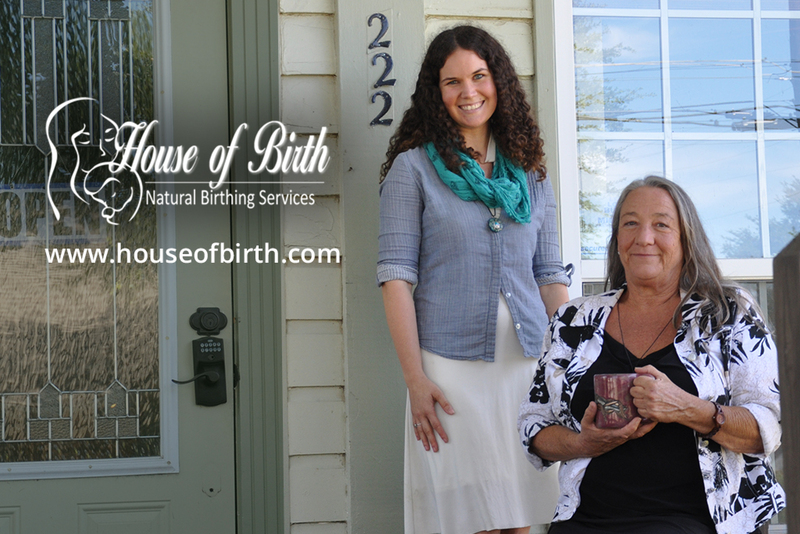 I believe in supporting and facilitating the natural birth process at House of Birth. I support you through labor as needed and try to make your labor as relaxed as possible. (Research shows that stress increases pain and slows the progress of labor.) I do not perform unnecessary interventions or keep you on a “labor curve”. By the time labor begins, you will be familiar with the birth rooms and staff. You will be well prepared by the excellent childbirth classes you have attended and books you have read. In labor you will wear your own clothes, and eat your own food. You will be encouraged to walk and change positions often in order to facilitate comfort and progress. I will encourage you to listen to your body and get into the best position for your labor and birth. I do not perform routine episiotomies. Instead, I use warm compresses and oils during birth to minimize tears. How do you monitor the baby during labor? I use a handheld doppler to listen intermittently to the baby’s heartbeat during labor. Research shows that listening intermittently is as effective as continuous electronic fetal monitoring in identifying problems during labor and delivery with lower c-section rates, but with the same neonatal outcomes. What happens if there is a problem during my pregnancy or birth? Midwives specialize in normal pregnancy, labor, and birth. I focus on healthy lifestyles in order to prevent complications. I work with a collaborating physician to discuss complications. If complications arise during your pregnancy, I may consult, have you visit, or transfer your care to the hospital- based physicians. During labor, I carefully monitor both the mother and baby. As my ultimate goal is a healthy mom and healthy baby, I do not hesitate to transfer care to the hospital if I sense the potential for a complication. I will not compromise safety in order to have an out of hospital birth. Is it true that I go home the same day I have the baby? Yes. My clients are healthy women with normal, un-medicated births and healthy babies. You can expect to stay here about two to eight hours after birth, or until you are stable. You will have emptied your bladder, eaten, breastfed the baby, and watched the newborn exam. After that, you will be ready to get home to your own comfortable bed to continue recovery and bonding with your new infant. Before discharge, I show you how to take care of yourself at home. I’ll talk to you in the first 24 hours to be sure you and the baby are doing well. You will contact your pediatrician for initial care. I will see you within 72 hours in your home to check on you and the baby, to be sure all is well. Both you and the baby come back to House of Birth a week or so later for a check-up. Your care ends at about 6 weeks postpartum with a well woman visit.